Paste preparation is one of the critical steps in determining both the quantity and quality of the oil obtained from an olive oil extraction line. The main goal of the crusher is to break the fruit into small pieces to allow for easy release of the oil in the malaxer and eventual recovery in a horizontal decanter. The way the crushing is done affects the quantity of oil released, the taste of the oil and the oxidative stability of the oil. 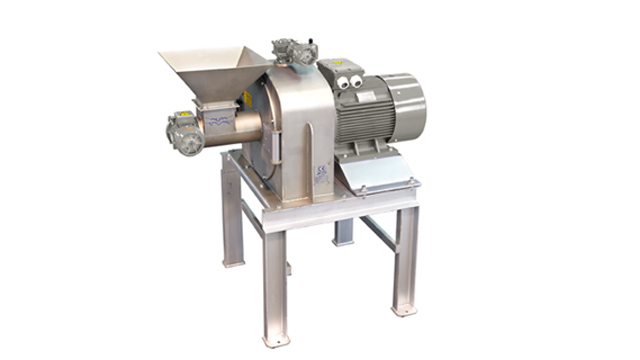 Alfa Laval crushing and depitting machines are designed for maximum strength and reliability. Easy maintenance and cleaning have also been taken into account. Olives are fed to the crusher through a short screw-conveyor assembly that leads the olives into the zone where rotating hammers equipped with wear-resistant metal plates crush the olives against a stationary grid. The diameter of the holes in the interchangeable grid determines the thickness of the paste. After passing through the grid, the paste drops into a hopper or directly into a pump, from where it is transported to the malaxing section. Olives are fed to the crusher through a short screw-conveyor assembly that leaves the olives between two toothed discs, one stationary, one rotating. The discs tear the olives apart and the resulting paste drops into a hopper or directly to a pump from where it is transferred to the malaxing section. Olives are fed to the depitter through a short screw-conveyor assembly that leads the olives into a special chamber fitted with bores. A rotating mixer moves the olives towards the periphery where the pulp is separated from the pit, which is ejected – unbroken and clean – at the end opposite to the feed. The pulp passes through the basket holes in the chamber and drops into a hopper beneath, from where it is sent to the malaxing stage.